Saturday 1 March saw the commencement of Shree Ghanshyam Maharaj Amrut Mahotsav, marking 70 years since Gurudev Jeevanpran Shree Muktajeevan Swamibapa inaugurated the divine Murti of the Lord at Shree Swaminarayan Mandir Maninagar. The Mahotsav also marks 35 years since Jeevanpran Swamibapa bequeathed His Divine Holiness Acharya Swamishree Purusottampriyadasji Maharaj with the helm of Shree Swaminarayan Gadi – the true office of the Lord Himself. The day commenced with Acharya Swamishree Maharaj performing Mangla Aarti to Lord Swaminarayanbapa Swamibapa at Shree Swaminarayan Mandir Maninagar, which was beautifully decorated with fragrant white moghra flowers throughout. At precisely 8am, Acharya Swamishree Maharaj arrived at the Suvarna Tula Smarak Bhavan - Shree Swaminarayan Tower, where hundreds of eager disciple had gathered for His darshan. After performing darshan at the Tower, Acharya Swamishree boarded a magnificent Chariot that was to be drawn by the principal sponsors of the Mahotsav. Shree Muktajeevan Pipe Band London and Shree Swamibapa Swamishree Music Band Maninagar led the Chariot, sants and disciples into the Sabha Mandap, which was already brimming with people from all over the world who had gathered for this auspicious event. Both Bands saluted Lord Swaminarayanbapa Swamibapa and Acharya Swamishree Maharaj once He had arrived on the impressively decorated stage, before taking their leave. The Sants and disciples of Lord Shree Swaminarayanbapa Swamibapa have gathered here today, at the headquarters of Shree Swaminarayan Gadi Sansthan, Shree Swaminarayan Mandir Maninagar, at lotus feet of Lord Shree Swaminarayan. Exactly 70 years have passed since our beloved Gurudev Shree Muktajeevan Swamibapa prayed to the supreme Lord to manifest here, and in celebration of that historic moment, we are celebrating the ‘Shree Ghanshyam Maharaj Amrut Mahotsav’ commencing today. In 1977, almost 37 years ago, at this very location, we celebrated the 70th manifestation day of Gurudev Swamibapa, which was called the Amrut (nectar) Mahotsav. However, there are many young Sants and disciples who are not old enough to have experienced the bliss of that Amrut Mahotsav. So Swamibapa is once again giving us all an opportunity to partake in drinking divine nectar during this Amrut Mahotsav. 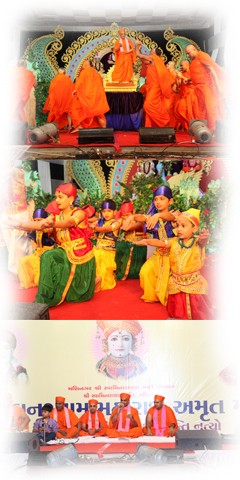 The Gujarati name, ‘Shree Ghanshyam Maharaj Amrut Mahotsav’ comprises of 16 letters. Even the name of this Mahotsav indicates the glory of this Organisation; the radiance of Shree Swaminarayan Gadi radiates in all 16 directions. The significance of this sacred site is indescribable. Even the deities come here to experience true, eternal peace and tranquillity. This is where the close intimacy with the almighty Purna Purushottam Lord Shree Swaminarayan is attained. Divine love for the supreme Lord can be sensed in everyone’s faces today. Such innocent and faithful love is due to the divine love that Gurudev Swamibapa has shown us all. It is due to His mercy that we are able to sit here, at the lotus feet of Lord Shree Swaminarayanapa Swamibapa. Although there is an endless string of Mahotsavs being celebrated at Shree Swaminarayan Gadi, the Sants and disciples do not tire in pleasing the Lord in whichever manner that they can. They are eager to offer their physical, mental and financial support for the progress of our Faith. All this devotion is being seen by the Lord, and is being deposited in His fixed deposit vault under your names. The interest that you will gain is boundless. The glory of this sacred land where we are sitting is also boundless. The supreme LordShree Swaminarayan Himself was fond of this very location and consequently, He came here over and over again. This fact is corroborated in the scriptures written by the Nand status Sants of the time. Previously, when Lord Shree Swaminarayan first came to this location, there was a mango shrove situated here. That auspicious day was Samvat 1865 Maha Sud 1, Monday 16 January 1809 CE. He then came here a further four times. Each time He came here, He presided underneath a large mango tree. That mango tree stood at the very location where Lord Shree Swaminarayan – Shree Ghanshyam Maharaj magnificently presides here today. Lord Shree Swaminarayan will preside here for all eternity. He regards this to be His home and will give His divine darshan and blessings from here forever. Those who genuinely wish to attain eternal salvation and become immersed in His Murti will devotedly serve Him from here. Those who come here with faith and dedication will be freed from the mire of worldly miseries. Let us pray to the almighty Lord Shree Swaminarayanbapa Swamibapa – ‘we have come to Your sacred lotus feet to seek Your divine mercy and grace. May we develop the wisdom, faith and devotion to remain worthy of Your kindness and blessings. Give us the intelligence, strength, devotion and convictions so that we remain devoted unto You forever’. Following His Ashirwad, Acharya Swamishree Maharaj presented three charitable cheques on behalf of Maninagar Shree Swaminarayan Gadi Sansthan: Rs 150,000 to Sahyog Krusht Yagna Trust, Rs 75,000 to Mandbudhi and Baheramung Shala, and RS 75,000 to Patidar Sewa Samaj Heematnagar. In celebration of this auspicious Mahotsav, the direct descendant of Dada Khachar, Bhaghu Khachar, and the direct descendent of Jeeva Khachar, Uday Khachar, had come for the darshan of Acharya Swamishree Maharaj. Both Dada Khachar and Jeeva Khachar were ardent disciples - often cited in scriptures and whose devotion is depicted in the ‘Sarvopari Shree Swaminarayan’ television serial, in the Lord’s time, over two hundred years ago. Having recognised Maninagar has the true home of the Supreme Lord Shree Swaminarayan, they brought their entire families to take part in Shree Ghanshyam Maharaj Amrut Mahotsav. The first evening event of Shree Ghanshyam Maharaj Amrut Mahotsav was a concert of music, singing and dance acts, performed by the sants and disciples of Maninagar Shree Swaminarayan Gadi Sansthan. The occasion began when Acharya Swamishree Maharaj entered the Sabha Mandap to the joy of the eagerly awaiting crowd of thousands that could barely fit within the venue. The concert commenced with kirtan bhakti performed by Jeevanpran Swamibapa’s talented and devout sants. The evening included a drama production, Jungle Trip, which depicted the story of a group of seven friends who had gotten stranded in a jungle, only for their staunch faith in the Lord proving to be their saviour from a number of dangers. Important themes such as faith, humility and forgiveness ran through the storyline. Shree Muktajeevan Pipe Band London also performed. They showcased their blend of British-Indian identities with an especially prepared fusion of Scottish Pipes and Indian melodies and dhol drums. The finale to the evening was a playful devotional dance performed by the Sants, at the end of which they carried aloft Acharya Swamishree Maharaj’s Gadi through the audience for all to enjoy this wonderful darshan.